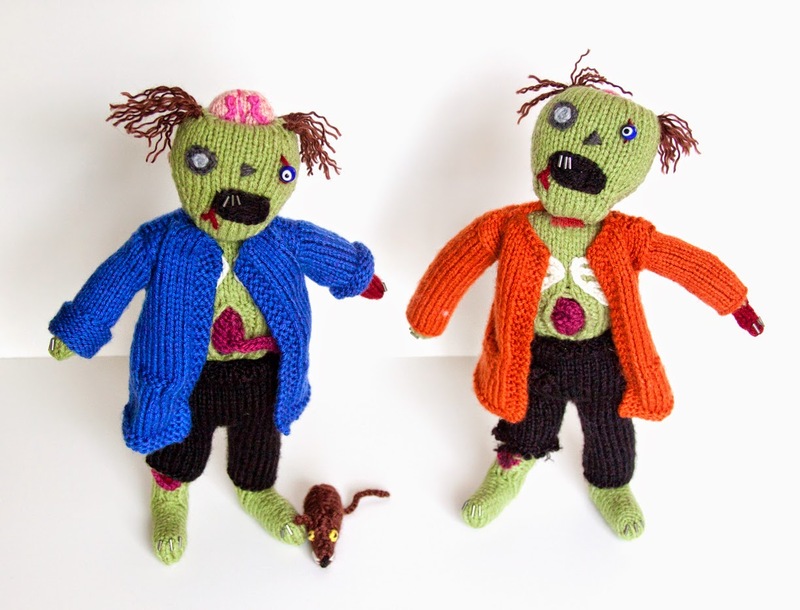 As requested, I made the zombie the same as my first zombie just with a blue coat (the recipient's favorite color) and adding his rat companion. I know I've talked about this project a ton on the blog over the last few months, but I figure I'll mention the specifics again for anyone just tuning in. 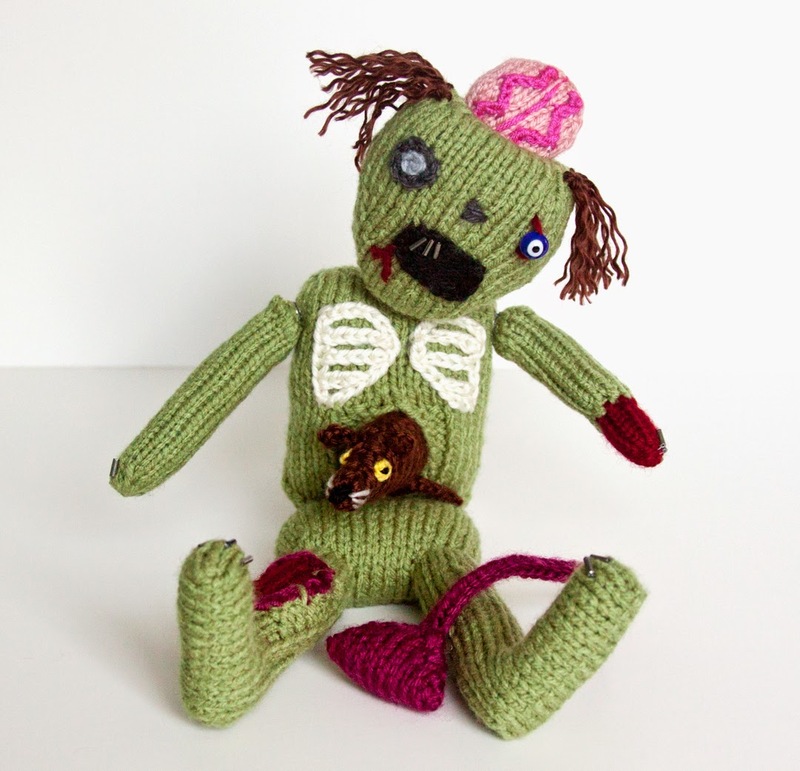 I used the Classic Zombie pattern by Fiona Goble (available free here) along with the brain and brain pocket instructions from the book Knit Your Own Zombie. The glory of the book is that you can pick and choose which elements you want to add. The yarns I used are Red Heart With Love in Lettuce (skin/body); Vanna's Choice in Cranberry (anything blood looking), Purple (stomach pocket), and Charcoal (eye socket and nose); Caron Simply Soft in Raspberry (intestines and around wounds), Chocolate (hair and rat), and Black (pants and mouth); Red Heart Soft in Cream (rib cage); Bernat Softee Baby in Soft Peach (brain); Lion Brand Microspun in Fuchsia (brain squiggles); Patons Canadiana in Gray (eye socket); and Premier Everyday Soft Worsted in Royal Blue (jacket). I also used red velcro at the torso and head, metal snaps at the shoulders, gray bugle beads for the nails, and a glass bead for the eye ball. 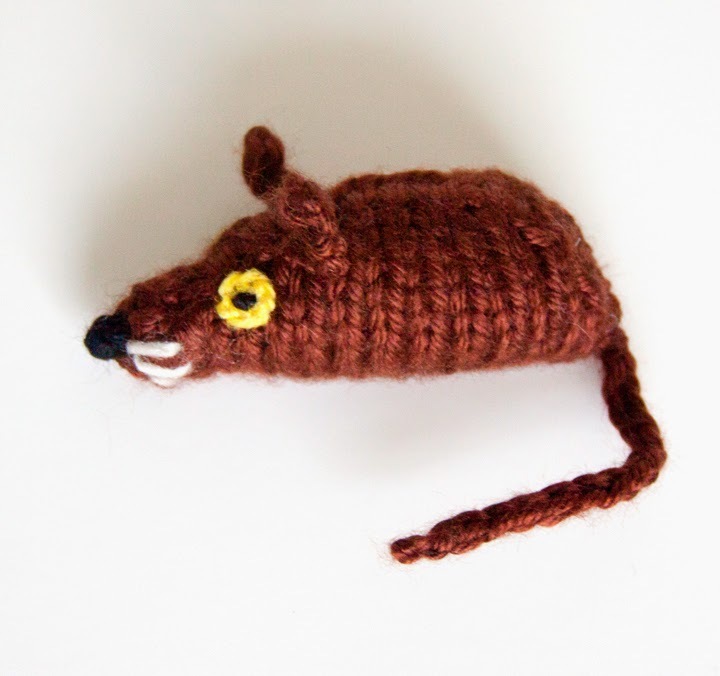 Comrade Ratlovich says, "Oh, hello there folks. Don't mind me!" - in a Russian accent, of course. Here's a little crime scene photo, lol. Everything is stitched and embroidered by hand. "Oh, you don't need these intestines anymore, do you?" Anyway, lots of photos. Just like last time, the amount of photos in this post directly reflects the amount of work involved in making it, lol. And now for detail shots. 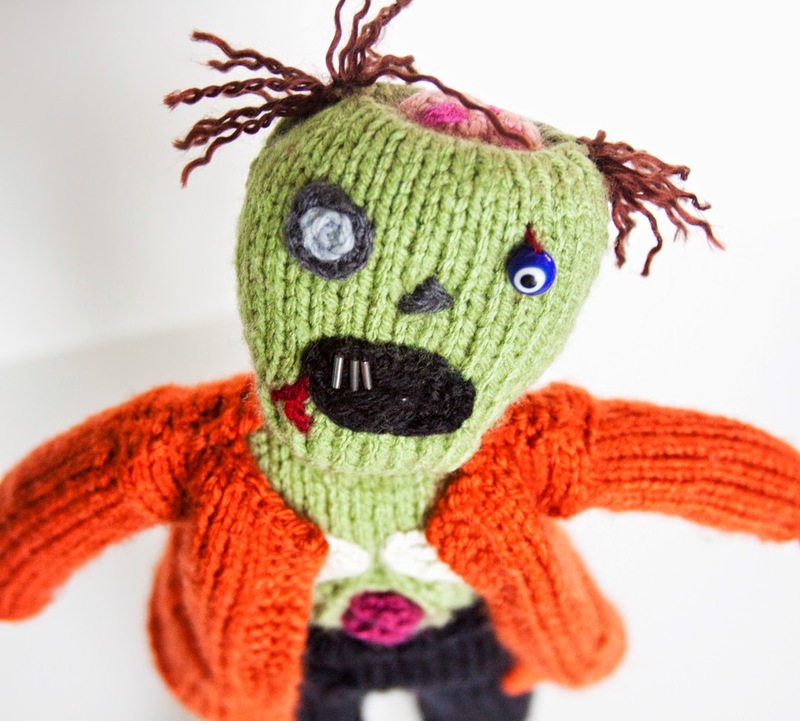 I only had one issue come up this time - the blue yarn I used must be slightly thicker than the orange I used last time for the first zombie, because the coat came out bigger. This isn't really an issue except that it made the arms longer, so I had to roll up the sleeves like cuffs - easy fix. lol This is seriously one of my favorite angles to photograph these guys. I really love how Comrade Ratlovich came out - so much so that I think my brother will be getting a rat of his own for Christmas to complete his zombie set. 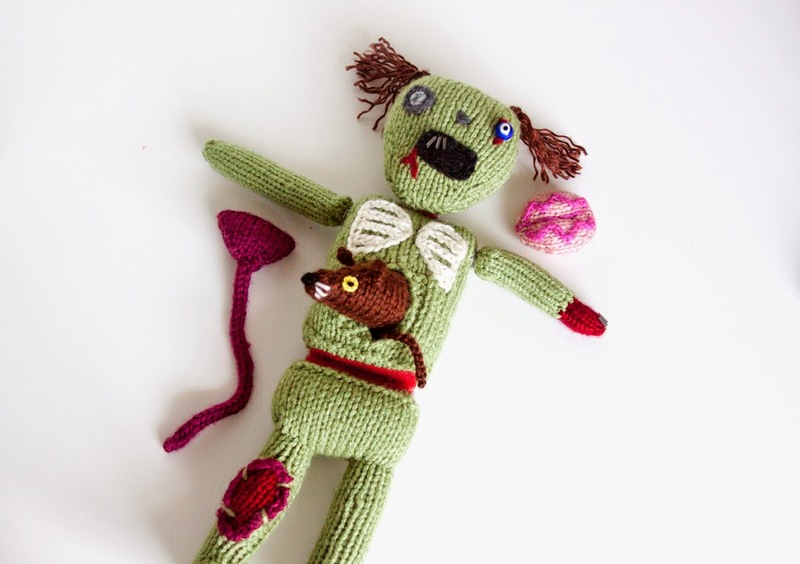 This guy certainly took a long time to make - the only pieces that are knit are the actual body (2 pieces), everything else is embroidered on. 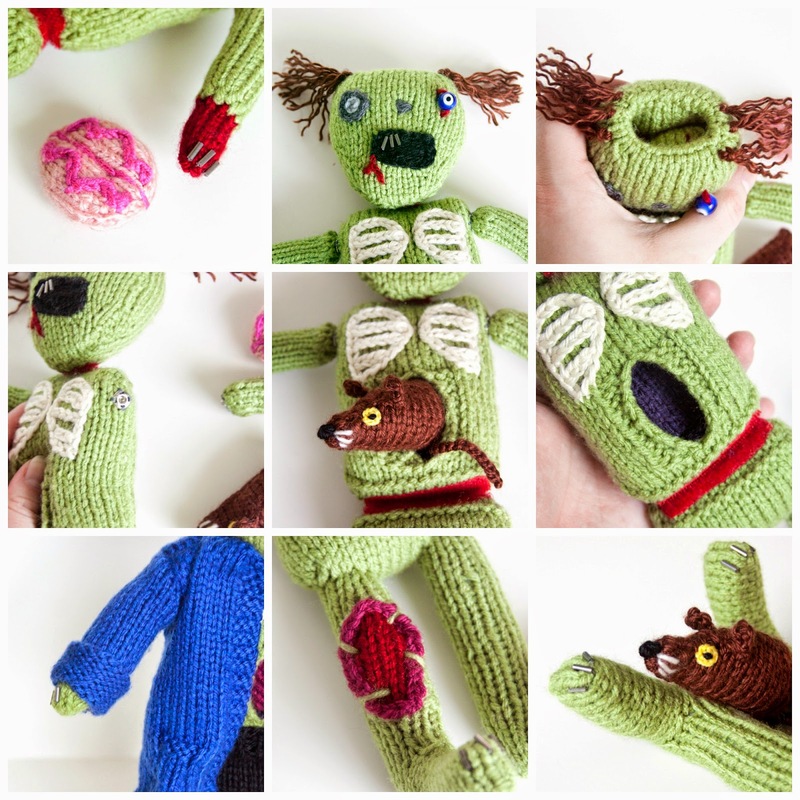 I borrowed back the original Birthday Zombie so I could officially give him an eye ball, and I couldn't resist a photo of them all together. Just imagine lots of groaning and it will complete the picture. And here is a closeup of the new eye ball in action :) It's pretty crazy how it make the face look so different. 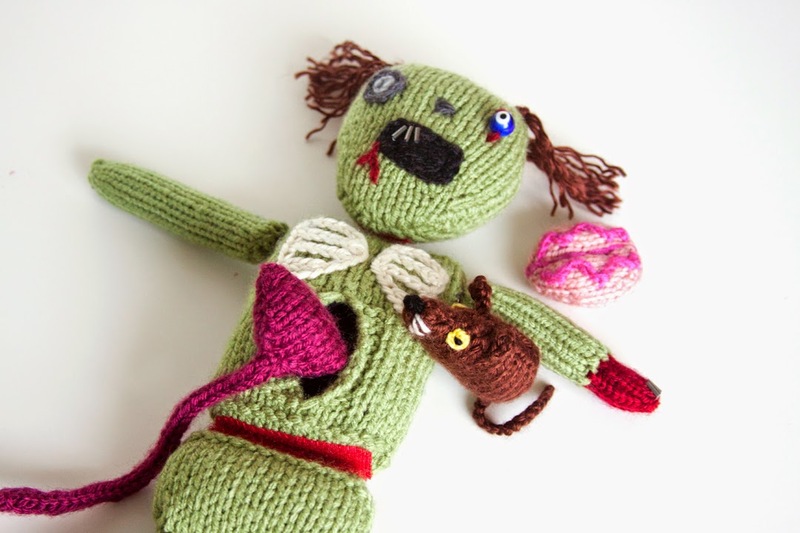 I packaged up Zombie 2.0 and Comrade Ratlovich and delivered them last night. 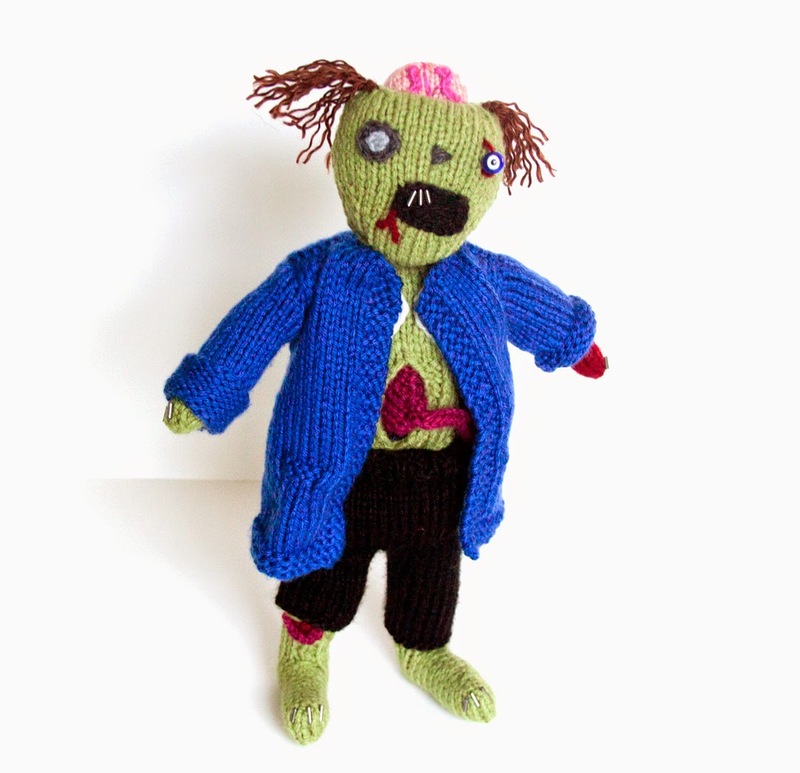 Yesterday was Eryn's birthday, so she will probably already have them by the time this post goes up :) I've been promised photos of Eryn with her zombie (and quite possibly her new favorite shirt - it says If Darryl Dies, We Riot, lol).I'm beyond thrilled with how this guy came out and I really hope Eryn loves it!